The Earth, our home has a lot of beautiful, amazing locations – and some strange places as well. These weird places sometimes look “impossible”, sometimes dangerous, sometimes scary, but despite all that, still can be beautiful. Here are ten of them. My strange places list begins with the boiling river of Amazon rainforest. Yes, it is “almost” boiling – with an average temperature of 86˚C (186.8˚F), the amazing river in Peru can boil you to death. It has been reported that sometimes animals fall into it, and dye in a slow and really horrible way. The river was a legend in the area for centuries. Its local name is Shanay-timpishka, means “boiled with the heat of the Sun” in English. Peruvian geologist Andrés Ruzo had fascinated with the myth since his childhood. In 2011, he made a trip into the Amazon rainforest with his aunt, and finally his dream became reality. The river is huge (for a hot stream): up to 25 meters (82 feet) wide and six meters (20 feet) deep, and runs for 6.24 km (3.87 mile). And the most amazing part is: there is no volcanic activity around. The hot streams are usually connected with the volcanic activity. So, how come the river is that hot? According to Ruzo, the chemical analysis carried out by him showed that the water is meteoric – this means the water originally fell as rain – to somewhere, the exact starting point is still unknown. After falling, probably the water going underground, and going too deep. Then it is getting heated up by the geothermal energy of Earth. Then again going up to the surface, right into the Amazon rainforest. Watch Andrés Ruzo’s TedX talk titled “How I found a mythical boiling river in the Amazon”. When Andrés Ruzo was a young boy in Peru, his grandfather told him a story with an odd detail: There is a river, deep in the Amazon, which boils as if a fire burns below it. 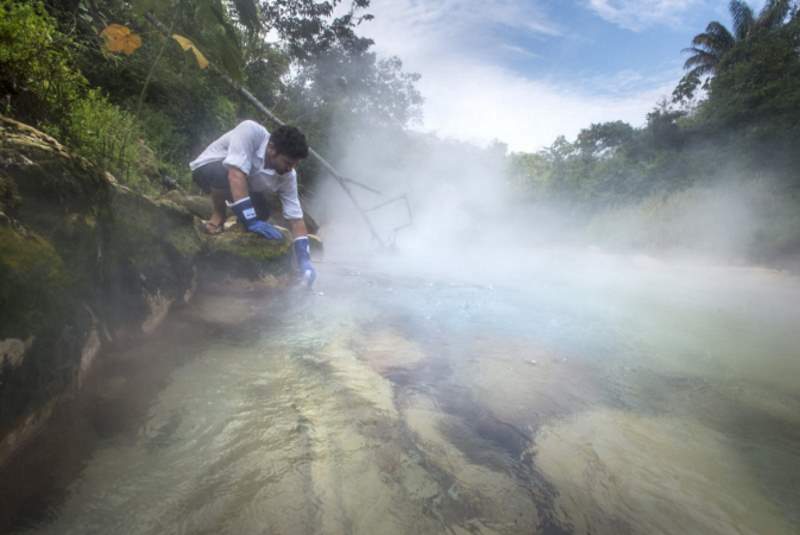 Twelve years later, after training as a geoscientist, he set out on a journey deep into the jungle of South America in search of this boiling river. At a time when everything seems mapped and measured, join Ruzo as he explores a river that forces us to question the line between known and unknown … and reminds us that there are great wonders yet to be discovered. This mysterious Oregon lake is named “Lost Lake”, and once a year, it actually gets lost: it drains itself down a hole every year. The cause of this extremely rare phenomenon is a geological feature called a lava tube. A lava tube is a natural conduit formed by flowing lava which moves beneath the hardened surface of a lava flow. Tubes can be actively draining lava from a volcano during an eruption or can be extinct, meaning the lava flow has ceased and the rock has cooled and left a long, cave-like channel. But why the lake gets lost only once in a year? Because in the early spring, the water from the melting snow on top of the Cascade Range fills the lake faster than the hole can drain it. After most of the snow melts, the hole overcomes and the lake empties itself. This weird mountain serves as the triple border point of Venezuela (85% of its territory), Guyana (10%) and Brazil (5%). 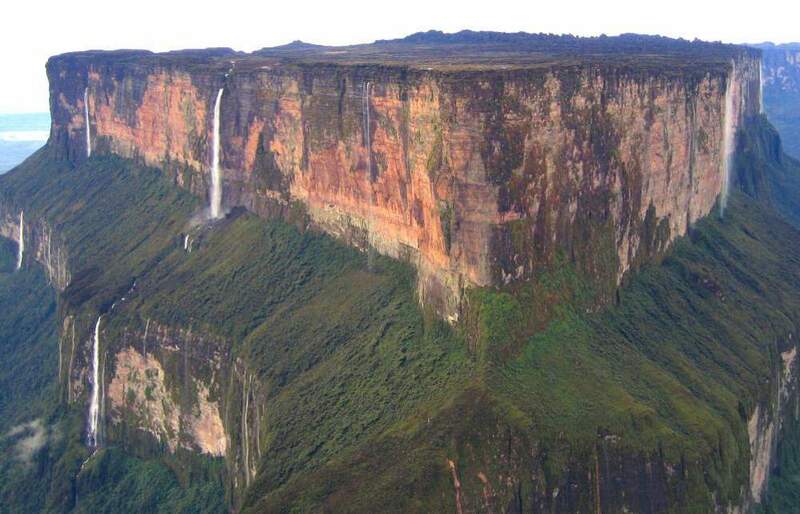 It is the highest of the Pakaraima chain of tepui plateaus in South America. It look unusual, rather than finishing in a peak like most mountains, its top is a large plateau. On the summit plateau, it rains almost every day of the year. Almost the entire surface of the summit is bare sandstone, with only a few bushe and algae present. Although the steep sides of the plateau make it difficult to access, it was the first recorded major tepui to be climbed: Sir Everard im Thurn walked up a forested ramp in December 1884 to scale the plateau. This is the same route hikers take today. Any other approach will involve climbing gear. As the mountain is entirely bordered on both these sides by enormous sheer cliffs that include high overhanging (negative-inclination) stretches, these are extremely difficult and technical rock climbing routes. Strange places: This clip is about a 12-day trip to the top of the world – the summit of Roraima Mountain located in Canaima National Park, Venezuela. Half-day travel by four wheel drive on unpaved road, hiking (backpacking) for 2 days to reach the base, sleeping in a tent for 9 days total, away from civilization and conveniences. Taking baths in a river, eating packaged food, climbing the steep rock walls on the edge of the enormous sheer cliffs to 2,810 m (9,219 ft) elevation at the top, rain or shine. 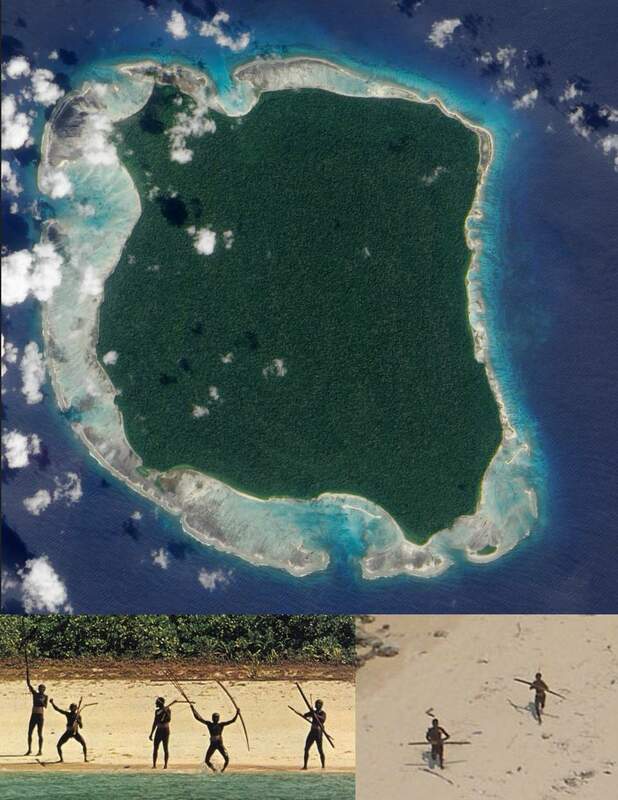 North Sentinel Island and Sentinelese people. North Sentinel Island is one of the Andaman Islands in the Bay of Bengal. It lies to the west of the southern part of South Andaman Island. It is small, forested, located away from the main settlements on Great Andaman, surrounded by coral reefs, and lacks natural harbors. The island itself isn’t strange. But, the inhabitants of it are: a group of indigenous people, the Sentinelese, live on North Sentinel Island. Their population is estimated to range from 50 to 500 individuals. The Sentinelese reject any contact with other people and are among the last people to remain virtually untouched by modern civilization. After the 2004 Indian Ocean tsunami an Indian government helicopter confirmed that they were unaffected by the tsunami. Interestingly, they tried to fend off that helicopter by throwing stones and arrows. Although the tsunami disturbed the fishing grounds of the Sentinelese, they appear to have adapted. On 26 January 2006, two fishermen were killed by Sentinelese when their boat drifted near the island. The first peaceful contact with the Sentinelese was made by Trilokinath Pandit, a director of the Anthropological Survey of India, and his colleagues on 4 January 1991. Indian visits to the island ceased in 1997. Jacob’s Well is a perennial karstic(1) spring in the Texas Hill Country cave descends vertically for about 30 feet (9.1 meters), then continues downward at an angle through a series of silted chambers separated by narrow restrictions, finally reaching an average depth of 120 feet (37 meters). The cave is an attraction for open-water divers, but if you want to dive there, you should be very careful: is one of the most dangerous places to dive. If you are not experienced diver, simply do not try this: some of whom are inexperienced with the specialized techniques and equipment used in cave diving which has resulted in eight fatalities at this site. 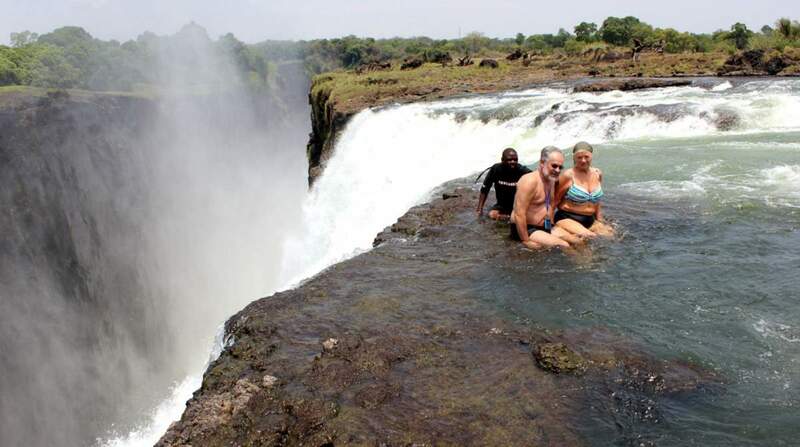 The Victoria Falls is neither the highest nor the widest waterfall in the world, it is classified as the largest, based on its combined width of 1,708 meters (5,604 feet) and height of 108 meters (354 feet), resulting in the world’s largest sheet of falling water. For most of the year, anyone foolish enough to enter the waters would be instantly swept to their deaths. But in the dry season (usually between September and November), the reduced water levels create the world’s highest and most amazing infinity pool: the Devil’s Swimming Pool. It is formed by a rock barrier at the edge of the falls. If you do not something foolish, it is safe to swim in it if the water levels reduced enough. The “Door to Hell” (also known as the Gate to Hell, the Crater of Fire, Darvaza Crater) is a natural gas field in Derweze, Turkmenistan, that collapsed into an underground cavern in 1971, becoming a natural gas crater. Geologists set it on fire to prevent the spread of methane gas, and it has been burning continuously since then. The diameter of the crater is 69 meters (226 feet), and its depth is 30 meters (98 feet). Today, the crater is a popular tourist attraction. Strange places: Door to Hell drone footage. Judge C. R. Magney State Park is a state park of Minnesota, USA, on the North Shore of Lake Superior. 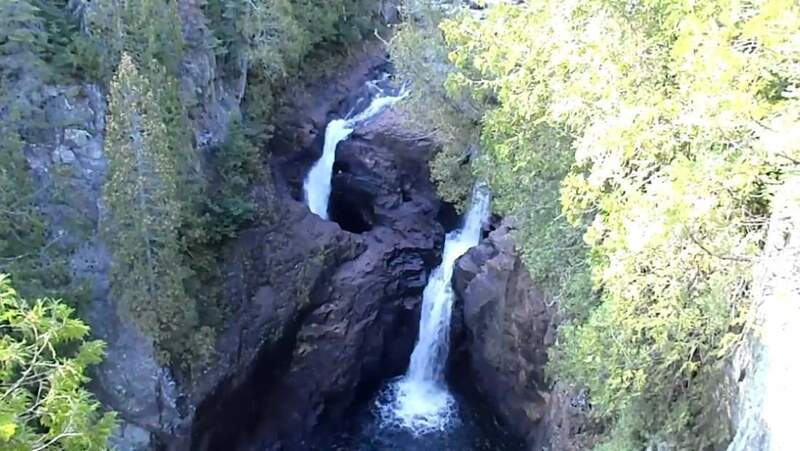 The park is best known for “The Devil’s Kettle”, an unusual waterfall located on the Brule River 1.5 miles (2.4 km) from its mouth. The river splits in two to flow around a mass of rhyolite rock. The eastern flow goes over a two-step, 50-foot (15 m) waterfall and continues downstream. The western flow surges into a pothole, falling at least 10 feet (3.0 m), and disappears underground. It is believed the water rejoins the main channel of the river or has a separate outlet into Lake Superior, but it has never been located. Researchers have dropped brightly colored dyes, ping pong balls, and other objects into the Devil’s Kettle without result. There is even a legend that someone pushed a car into the fissure, but given that the Devil’s Kettle is wholly inaccessible by road, most commentators dismiss this as hyperbole. 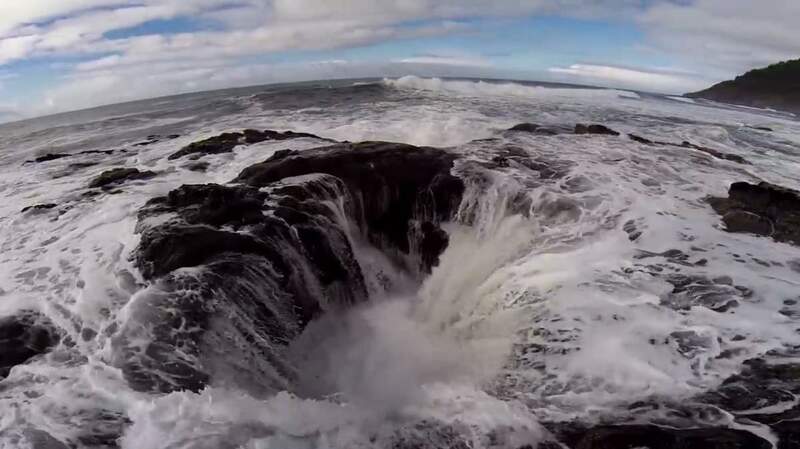 Sitting on the edge of the Oregon coast, at Cape Perpetua, there’s a dangerous sinkhole which known as “Thor’s Well”. It is one of the three unique features of Cape Perpetua, the other two are the “Devil’s Churn” and the “Spouting Horn”. They are popular with visitors; however, all three can be dangerous especially at high tide and during winter storms. 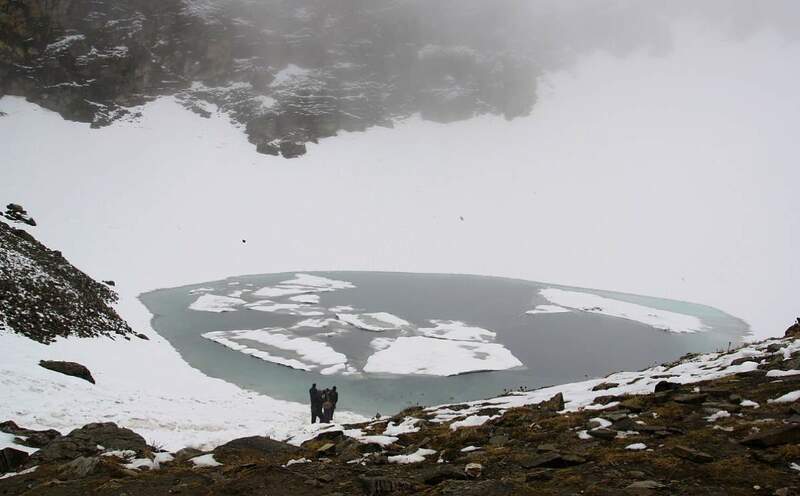 Having a depth of about two meters, Roopkund is a shallow, high altitude glacial lake in the Uttarakhand state of India. The area is uninhabited, in the Himalayas at an altitude of 5,029 meters (16,499 feet). Surrounded by rock-strewn glaciers and snow-clad mountains, the lake is a popular trekking destination. What makes the lake so strange? Hundreds of human skeletons found at the edge of it. Because of these human remains, the lake has been called Skeleton Lake in recent times. Why the skeletons are there, and who were these people? Many theories and opinions exist, from purely spiritual to scientific ones, attempting to explain the existence of these skeletons, which date back to 9th century CE. 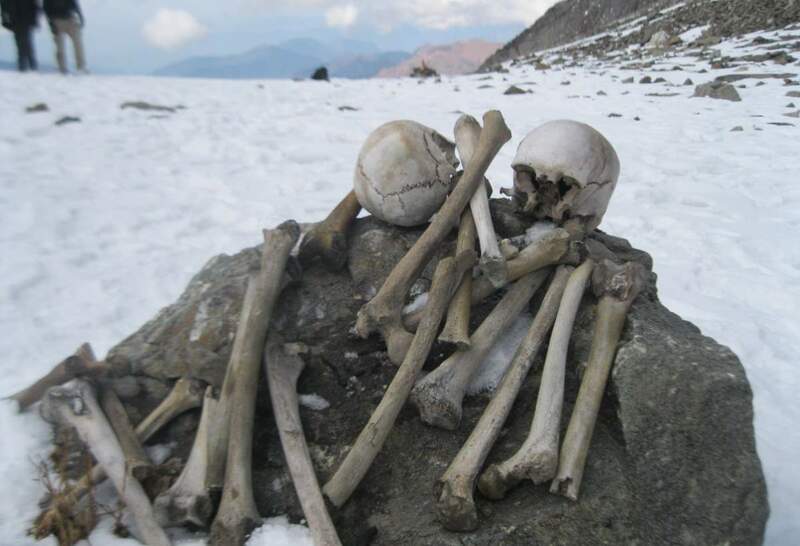 In 1942 a British forest guard in Nanda Devi National Park, Roopkund, made an alarming discovery: around and inside a frozen lake, there are a lot of skeletons. In the summer of 1942, the one-month period of ice melting revealed even more skeletons, floating in the water and lying haphazardly around the lake’s edges. Remnants belonging to more than 300 people have been found. Along with the skeletons, wooden artifacts, iron spearheads, leather slippers, and rings were also found. When a team from National Geographic magazine retrieved about 30 skeletons, flesh was still attached to some of them. Geneticists, Niraj Rai along with Manvendra Singh at the Center for Cellular and Molecular Biology at Hyderabad, conducted DNA tests on a hundred samples from the lake and compared them to the current Indian population. Results indicated that 70 percent of them had an affinity with Iran, while the remaining belonged to the local population. It is hypothesized that the Iran group took the help of local porters to seek new land for settlement. Later studies placed the time of mass death around the 9th century CE (1,200 years old). Local legend says that the King of Kanauj, Raja Jasdhaval, with his pregnant wife, Rani Balampa, their servants, a dance troupe and others went on a pilgrimage to Nanda Devi shrine, and the group faced a storm with large hailstones, from which the entire party perished near Roopkund Lake. What has not been determined is where the group was headed. There is no historical evidence of any trade routes to Tibet in the area, but Roopkund is on an important pilgrimage route of the Nanda Devi cult with Nanda Devi Raj Jat festivities taking place approximately once every twelve years. Now, scientists believe they have finally solved the mystery of the skeletons: recent finds may lend some support to the local legend mentioned above. In 2013, researchers concluded that it likely that the individuals had been killed in a hail storm. The injuries on the remains indicate that each person was killed by one or more blows to the head, neck, and shoulders. There do not appear to be injuries on any other parts of their bodies, which rules out death by landslide, avalanche, or weapons. As of today, the conclusion that this group of people died due to a severe hail storm remains the most plausible explanation as to what happened to them on their ill-fated journey. However, there has been no verification as to whether this was a group traveling with the king of Kanauj, as the local legend states. Strange places: Roopkund is a glacial lake located at an altitude of about 5,029 metres in Uttarakhand, a state in India. When the ice melts, hundreds of human skeletons are seen below the surface or floating in the waters. Twelve Hundred years later scientists reach a startling conclusion. Karst topography is a landscape formed from the dissolution of soluble rocks such as limestone, dolomite, and gypsum. It is characterized by underground drainage systems with sinkholes and caves.